This Writing Grant Proposals eBook has been one of the simplest, yet most beneficial fundraising books that I have read so far. It's relatively short but perfectly comprehensive. It's easy to read and get's to the point (Pam Grow doesn't waffle on about unnecessary information). It can be used by (ignorant) Grant writing beginners - like I was - as well as seasoned veterans! It covers 5 steps (days) to researching, organizing and then writing Grant Proposals. On top of the 74 page eBook, it includes a comprehensive (100+ pg) Grant Proposals Toolkit full of "Sample proposals, letters, and forms to systemize your grant proposal writing process!" This eBook also comes with a Grant Proposal Tracking Database program that Pamela developed for organizations to comprehensively organize and track their Grant Proposals! It's really great stuff. 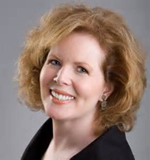 Pam Grow is a fundraising professional whom has been recognized as one of the top 50 most influential fundraisers and one of the top 30 most effective fundraising consultants. She spent 6 years working for one of America's largest private family foundations, which meant she examined every proposal that came through the door. She then successfully worked for a Nonprofit organization with a budget of $3 million a year. Difficult, right?! "I don't need to tell you that it was challenging! "This particular organization had run a hugely successful capitol campaign just five years prior. And what had they done since? "Nothing. Not a thing. Major donors were ignored. Foundation contacts lapsed. Key community organizations had fallen by the wayside. Worst of all, records were missing! Frankly, I thought that I'd taken on more than I could handle. "Without any history to go on and with a lot of other areas to cover (community and public relations, getting a website up and running, organizing our annual membership appeal and... well, you get the gist), I needed a system for researching prospective foundations, writing effective grant proposals and getting them out the door - fast!" And as you soon find out through the book, she was able to set that system up and through it, write highly effective and successful Grants. Her experience, and the advice and perspective that she shares on writing grant proposals is truly invaluable. You can find out more about Pam and her fundraising career through this interview I had with her. This fundraising book will help you increase your Grant Proposal success - Thanks to the wisdom and experience Pam Grow has put in to it! Writing grant proposals are for many causes an extremely important part to their fundraising. Receiving funds from foundations is one of their main forms of meeting their financial needs. This may be you! It is also a fundraising method that many groups do not use, BUT who could be using effectively every year. This may be you! Some of these types of groups are Schools and Churches. In fact, in many cases, individuals can also use Grant Funding to finance their needs. For example many foundations provide finance for scholarships, film projects, and other individual needs. Once again this may be you! Please read this important note for individuals further down the page. 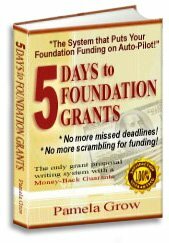 ...And you are already using, or could be using, Foundation Grants, then you will benefit greatly from reading "Writing Grant Proposals"! In my opinion it is your ultimate guide to excelling with this really profitable fundraising method! I'd suggest that you print a hard copy of both the Writing Grant Proposals eBook and the accompanying Grant Proposals Toolkit. Also install the Grant Tracking Database onto your computer or laptop. Then, with a highlighter and pen at hand, read through the entire book once, taking notes and highlighting important sections and lines. THEN, read through it again to deepen your understanding and knowledge. Once you've read it twice and you're ready to start implementing Pam's system, I'd suggest you keep these hard copies near at hand, to refer back to and to stay on track! Writing Grant Proposals was an absolute pleasure to read and has really deepened my knowledge in a section of fundraising that I have not had much experience in. Out of all the Writing Foundation Grant books that I have read this eBook by Pamela Grow has been the easiest and most beneficial! And you've got a brilliant formula for success! Then head over here to grab a copy of the Writing Grant Proposals eBook. Share your thoughts or review on the above book, below. Did it help you? Was it informative? What is your opinion of the book?! For example there may be Grants available for someone wishing to study Chemical Science at university in America but not for someone wanting to study a Business Degree (those are pure examples and I don't know whether there are Grants for either of those examples). SO, before you waste time studying Grant Writing, make sure that there are Grants available for your need or cause.